Of course, there is someone standing behind you and watching your every move in the online world. Well, even if there isn’t don’t just assume there never will be. The simple fact is that people need protection in order to protect their identity and guard their privacy online no matter what. Government agencies all over the world have only increased the funding that goes behind their surveillance programs and if there ever was a time to sign up for a decent VPN service, it was now and probably is now. Make no mistake, cyber criminals along with hackers are lurking in every nook and corner of the internet and they’re not planning to just sit there and wait for the opportunity to strike. They are planning and conniving all the time in order to read your tweets, emails and other sensitive pieces of communication between you and your contacts. With a decent virtual private network service installed on all your devices, you can rest easy knowing that your computer is protected. VPN Unlimited from KeepSolid is one of those virtual private network services that guard your browsing activities by encrypting your online traffic. It also anonymizes your existence on the internet so your business remains your business. Among the highlights is the unusually inexpensive VPN service from KeepSolid along with variable and accommodating subscription packages. Moreover, KeepSolid also provides many other features that are only seen in much more costly VPN services. Then there is the fact that KeepSolid is able to offer some decent speeds on most of its servers and doesn’t bog down your computer resources. All of these factors combine to make VPN Unlimited from KeepSolid a very enchanting deal, to say the least. VPN Unlimited from KeepSolid is considered to be one of the very best VPN services that are available in the market today. As mentioned before VPN Unlimited from KeepSolid offers new users as well as old ones a host of subscription packages. Really, there are so many subscription packages and you’re bound to find one that matches your needs and requirements to perfection. So let’s study them a little bit in more detail in order to know what’s on offer here and then you can make up your own mind if you want to buy or sign up for a subscription package that is offered by KeepSolid for VPN Unlimited. So start off, know that VPN Unlimited from KeepSolid offers news users about six subscription packages. As mentioned before, that is one heck a lot of choice for one VPN service and of course, the more the number of subscription packages, the more are the chances that you’ll be able to find the one that matches your needs. In other words, then we’re talking about VPN Unlimited from KeepSolid, we’re talking about a lot of choice, probably more than you care to understand and spend your time studying. But on the positive side, you’ll know exactly how much you want to pay for a specific package and how often will the company behind VPN Unlimited will charge you. Billing convenience along with package flexibility are really rare offering in the VPN business where most VPN services just try to go for one size fits all approach for all their packages. The first plan is the Vacation plan which is the cheapest of the lot. It is aimed at those users who only use VPN services when they are on a short journey away from home. This plan costs around $1.99 for seven days. Told you so, VPN Unlimited from KeepSolid offers some really weird packages and you can sign up to any one of them in order to suit your needs and requirements. Next up is the Economy plan which requires the user to sign up for VPN Unlimited from KeepSolid for a month long period. If you sign up for this package, you’ll have to pay around $4.99 per month. Then there is the Standard package which costs around $8.99 for a total of three months. As you can already imagine, this package is aimed at those users who are serious about sticking to a particular VPN service and not just run away after the initial trial period expires. After the Standard package, there is the Professional package which will cost you around $24.99 every year. As you can probably figure out yourself, this is for the people who are a really serious about signing up for a good VPN service and are ready to show some commitment to the VPN service. The other thing different about VPN Unlimited from KeepSolid, is that users are charged the full amount of the package at the time of billing. The company behind VPN Unlimited, that is KeepSolid, also offers a seven-day no questions asked money back guarantee. If that wasn’t enough already, then the company also offers a ten day free trial for users who sign up for a given package. 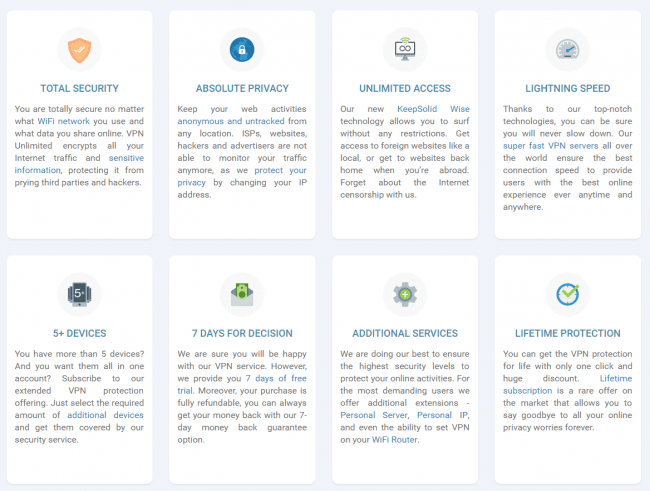 The monthly price for VPN Unlimited from KeepSolid may not sound like a lot but there are other VPN services out there that offer very similar packages in terms of price. We’re talking about Spotflux VPN and FrootVPN which also offer some very affordable packages. 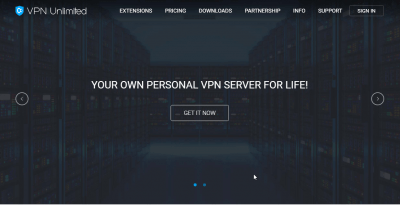 The part where VPN Unlimited from KeepSolid distinguishes itself from the two VPN services that we just mentioned above is the number of features and options it offers for the price it asks from the new users. Most of the features that VPN Unlimited from KeepSolid offers are usually seen in the more expensive VPN services and therefore, VPN Unlimited from KeepSolid will continue to give a lot of competition to VPN services from all spectrums regardless of price or features. Let’s assume for a second that you signed up for VPN Unlimited from KeepSolid and are absolutely over the moon with the quality of the service that you’ve received so far. We’ll, KeepSolid wants to be your preferred brand of VPN service not just for this life, but also the next one assuming you’ll need a VPN service there. Yes, we’re talking about KeepSolid’s Infinity plan which is essentially VPN service from VPN Unlimited from KeepSolid for a 100 year period. You can sign up for this outrageous package for about $499. But depending on your luck and your ability to regularly visit their site to check for discounts, you may be able to sign up for the infinity plan for less than $130. On the lighter side, KeepSolid which is the developer company behind the much reputed VPN Unlimited has stated on its official website that the company will have little problems in extending the infinity plan’s expiration date if the user requests it. If you’re really feeling up for it and want to spend a bit of extra money then KeepSolid also offers a To-Do Checklist app for just $33.99 per year as a bundle with the VPN service. However, if you don’t want to sign up for the additional offerings then you can sign up for VPN Unlimited from KeepSolid for a neat $69.99 for three years. KeepSolid offers a lot of payment options so you can bet that you’ll be able to pay quickly and easily when buying VPN Unlimited from KeepSolid. VPN Unlimited from KeepSolid has over 50 servers that are located in a very diverse set of countries, geographically speaking. We’re talking 50 servers in over 38 countries. Most of the 38 countries in which VPN Unlimited from KeepSolid operates its servers are physically located in Africa, China, Mexico, Russia, South America as well as the Isle of Man among many others. VPN Unlimited from KeepSolid is not entirely built from the ground up for BitTorrent and P2P service but unlike other VPN services which outright ban such activities, it offers file sharing services on four servers. Moreover, there is also a special streaming server for people who want to use the VPN service for HD video streaming on the internet. VPN Unlimited from KeepSolid also caters to the more advanced users who want their/his/her very own personal VPN service and that too in the country of their preference. It also offers a static IP address that is, as per official documents, not even associated with the VPN service. 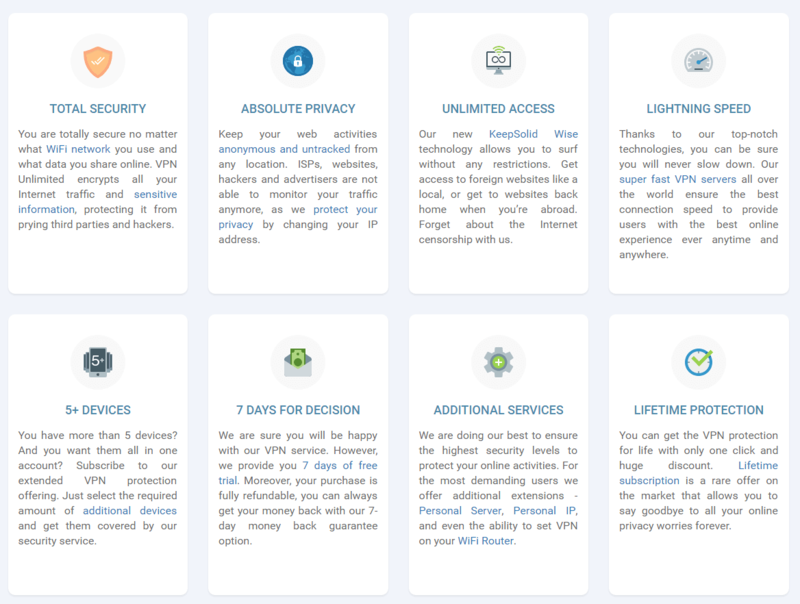 VPN Unlimited from KeepSolid provides these services to new users for a cool $80 per year (for the personal server in the country of your choice) and $6.69 per month for the static IP address with no trace of proxy service. You might ask what’s the advantage of signing up for such services? Well, in short, if you sign up for the above-mentioned services, you are more likely to have a clean and new IP address, which in turn means that you’ll be a lot less likely to get blocked from streaming services such as Netflix or Hulu. As mentioned before, VPN Unlimited from KeepSolid has a lot of standard features and we’ll come to those in a bit. But just to bait you in, we’ll start off with one of the more rare features. KeepSolid offers a feature called KeepSolid Wise and what it does is that it camouflages your VPN traffic as just the normal HTTPS online traffic. This kind of a feature can prove to be especially useful in regions and countries where access to the internet is restricted or outright unavailable. This feature also blocks attempts by organizations to block the use of VPNs in certain countries. Among other features, that aren’t too widely available in other VPN services, is the features of a browser extension. VPN Unlimited from KeepSolid has a full set of browser extensions for Chrome and Firefox, two of the most popular internet browsers of the online world. 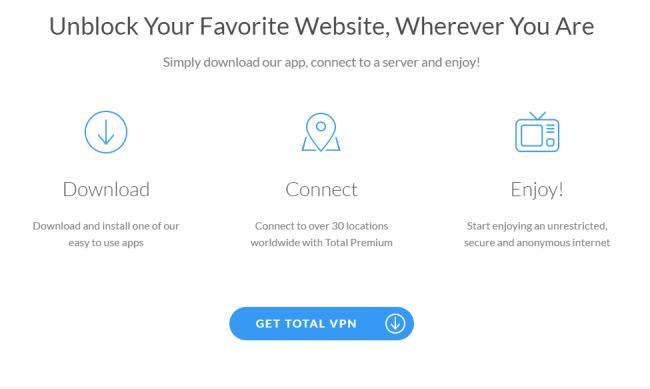 Nevertheless, the extension allows users to connect to the VPN service directly from the browser. All the users need to do is to install the extension and then log in and then muster up enough energy to perform another click to have all their online traffic encrypted and routed through a VPN server for a secure and anonymous connection. But this is where VPN Unlimited does you on better and takes VPN services to another level, the browser extension is not just an extension but also a mirror version of the desktop one in the sense that it has all the features and servers that are available in the desktop version. The browser extension also enables users to turn off some of the features that they might not want to use right away such as WebRTC functions. Some readers might think to themselves, what is the advantage of having a VPN extension rather than the full thing? Well, for one, users can have VPN protection on any computer they like as long as they have the extension installed on their favorite browser and second, using the VPN service from within the browser lowers the performance hit taken by your computer machine, desktop or laptop because then the software only has to encrypt the traffic that is going through your web browser rather than the whole computer. With that said, of course, the sole purpose behind using a VPN service is to secure all your traffic not just the one going through your web browser, so you might want to stay away from the browser extension if you’re concerned about this “whole” issue. VPN Unlimited from KeepSolid is available for a wide variety of operating systems including Android, Windows, Linux, Mac OSX and iOS. So if you have any of the devices that support these platforms then you’re good to go. This VPN service uses the very secure OpenVPN protocol for the connection made on operating systems such as Linux, Windows, and Android. For users who want to use the service on a Mac, they’ll have to make do with other protocols such as IPSec and PPTP. The iOS devices are supported by the IPSec protocol by default but the more savvy of the users can easily go to the settings menu and change that to something more secure such as the OpenVPN protocol. The best thing about signing up for VPN Unlimited is that it has native clients for all the major operating systems such as Windows, Linux, Android, iOS, OSX and also Windows Phone which is a rarity. 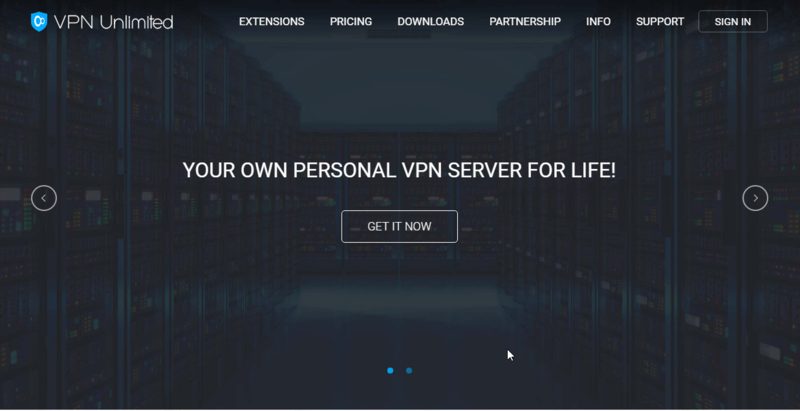 The fact that VPN Unlimited is a premier VPN service is also proven by the fact that just like all the other top players, it too allows users to connect up to five simultaneous devices to its servers. Installing the VPN service is mostly a breeze where users just have to download an installer file and then run the installation wizard. On the Windows platform though , there is one little hiccup which is that users have to install the Microsoft C++ 2013 Redistributable environment. But anyone who has ever installed anything on his desktop machine should be able to do that without much effort or time. The design of VPN Unlimited app is also a pretty solid one. New users can understand and access all the features fairly quickly as the interface does a great job of explaining each element of the app and its function. The developers showed some great common sense by placing the VPN connection on and off toggle switch at the top of the screen which makes the app intuitive to use overall. Some users have complained about VPN Unlimited taking some time to connect and disconnect but most of the users should be fine. There are multiple buttons placed on the left side of the screen that show users their account information along with quick access to the list of available servers. There is also the right panel which allows a user to see all the available VPN servers and on top of that there is a search box which is pretty handy as well. Every server that you see on the list shows its country of origin and the overall load on the server. So much so, the list also shows if activities such as torrenting are allowed on the particular server (that you’re looking at) that is selected from the list. As indicated earlier, VPN Unlimited from KeepSolid also offers high-speed servers which are focused on users with video streaming needs. There is also an Optimal option which enables user connection to the best server (according to its own understanding) for streaming at the given moment. VPN Unlimited from KeepSolid performed relatively well in Ookla speed benchmarks but increased the latency by a massive 300 percent. Regardless of which VPN service you sign up for, that is a huge latency increase which should be worked on right away by the developers behind the VPN service. Of course, latency variations are hard to detect especially for novice users so this shouldn’t be a dealbreaker for anyone. Ookla tests also showed that VPN Unlimited decreased download speeds by 30 percent. Readers should know that there are other premier VPN services out there that not only do not adversely affect your download and upload speed but actually, somehow, improve it. VPN services such as IPVanish along with PureVPN and ExpressVPN all are known to increase performance instead of decreasing it. As mentioned before, if you’re only using a VPN server in order to get secure and gain anonymity then you don’t need to worry about your internet connection’s performance taking a hit because of the VPN service. In short, VPN Unlimited is a good enough VPN service that during its use you will be able to load websites faster, even the ones where there is a lot of media content. You are not likely to face problems in streaming 720p videos on YouTube, which if you have used VPN services before, is a rare thing. 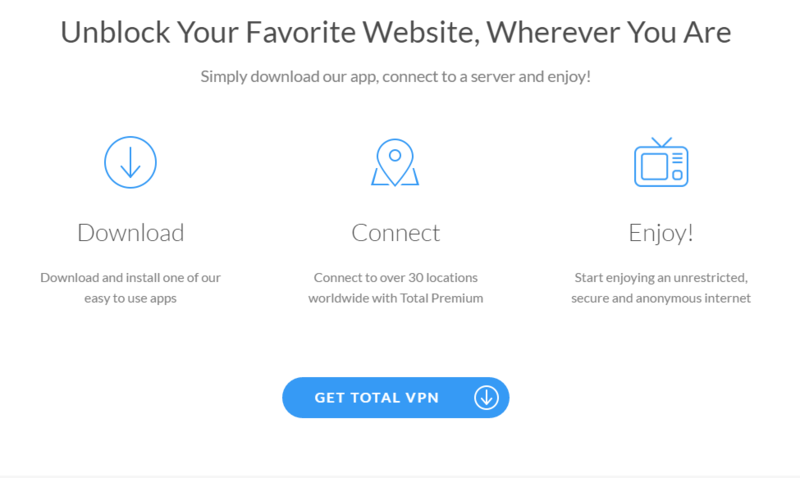 Should You Buy VPN Unlimited From KeepSolid? First, remember three rules. Whenever you are judging a VPN service you should always look for the speed it provides, the number of features it has and its adaptability. We can confidently say that VPN Unlimited from KeepSolid scores well in all the three aforementioned categories. The price is affordable and there are a lot of subscription packages. Along with that, it provides good speeds and has P2P support. It has native apps for all major operating systems and has dedicated streaming VPN servers along with browser extensions which make using this VPN service extra convenient. There are also some advanced features (we’ve talked about them earlier in the review) which put VPN Unlimited from KeepSolid in a league of its own. VPN Unlimited from KeepSolid is probably the most complete VPN service provider there is. It is affordable and has a great variety of packages available for any kind of user. It gives you decent speeds and has some advanced features which aren't normally available in VPN services that are this cheap. Plus, you can sign up for life and beyond.